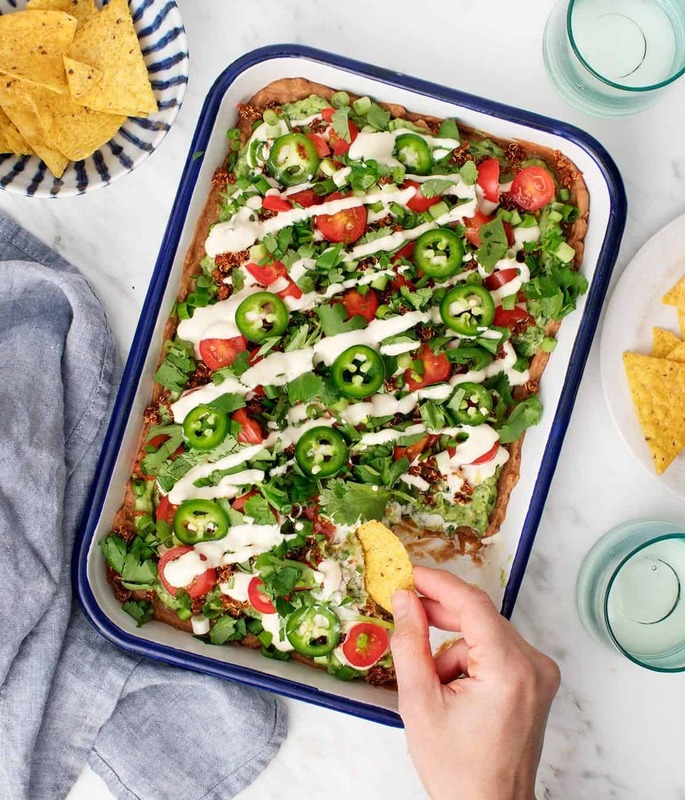 This vegan seven layer dip is perfect for game day or holiday parties! Made with refried beans, kale guacamole, spiced quinoa & cashew sour cream. I have a huge weakness for seven layer dip. Growing up, my mom made it for SO many holidays and gatherings. I’d be sure to grab a seat at the table right next to it so that I could gobble it up, chip after chip after chip after chip. In my family, this was (and still is) called Tex Mex dip. When Jack and I were first dating, he thought this was hilarious, and once I moved down to Texas with him I learned why – this dip is neither Tex nor Mex. In the intervening years, I also learned that I don’t like anyone else’s version except my mom’s. Hers may not be Tex Mex, but I love it, and it doesn’t have weird things like olives. So I decided to use my mom’s version as a starting point and actually made a fresh vegan version that taste’s pretty close to the original. The only visual difference is the lack of orange cheese, but all of the classic (to me) flavors really come through, especially with the refried beans and tangy guacamole. Instead of sour cream I used cashew cream and I added chili spiced quinoa to make it heartier. This should serve 4 to 6 as a normal appetizer, but of course Jack and I sat down and devoured (most of it) for dinner. 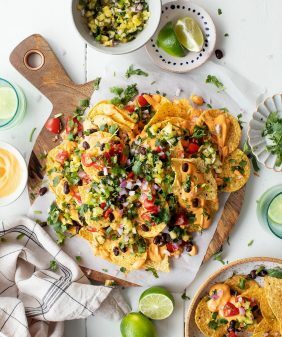 This vegan 7-layer dip is a great game day snack or party appetizer! 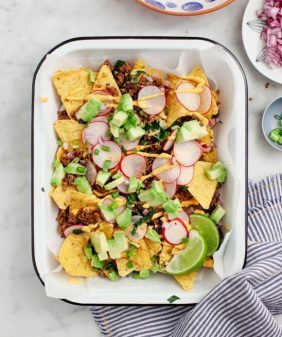 It's a healthy dish full of classic taco dip flavor. Make the Cashew Cream: In a blender, combine the cashews, water, olive oil, lemon juice and sea salt and blend until creamy. Chill until ready to use. Make the Spiced Quinoa: In a medium bowl, mix together the quinoa, garlic, chili powder, smoked paprika, cumin, lime juice, olive oil, sea salt, and maple syrup. Chill until ready to use. 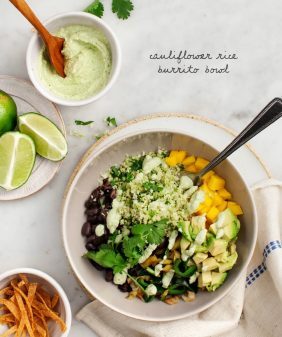 In a serving tray that's 8x12 (or similar), layer the refried beans, kale guacamole, cashew cream, and spiced quinoa. Top with the tomatoes, scallions, cilantro, more cashew cream and the jalapeños, if using. Serve with chips. This looks so great! That kale gauc sounds amazing, yum! So simple to make and super delicious! The flavors and textures were spot on. The Spiced Quinoa is genius. Planning on making this again ASAP! I made this dip for our super bowl party, and it vanished! So delicious. Didn’t miss the sour cream of cheese at all. New favorite! 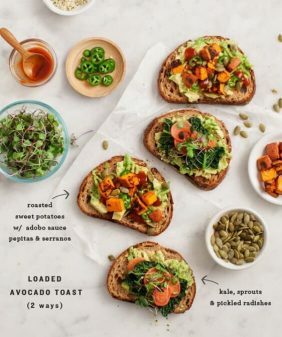 I love the traditional version of this too, but am really happy with this alternative while trying to eat healthier, while including legumes and other veg, so this works while keeping me away from beloved cheese and sour cream ingredients, thank you! Hi Nathan – yep, when I use almonds in place of cashews I get slivered almonds. They’re blanched and peeled so they will blend smoother than almonds with skins. 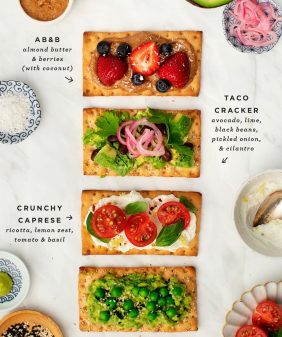 You could also use store-bought vegan sour cream in place of the cashew cream. Hope that helps! This is sooooooo good and filling! Better than any beandip I’ve tried. The kale guac is a nice healthy finishing touch! Thanks for sharing! I forgot to ask, how would you recommend I prep it for say I’m taking it to a pot luck the next morning? Hi Sal, I’m so glad you loved it!! 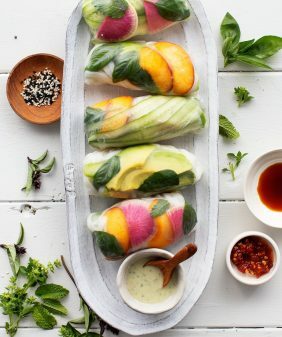 I’d make it the night before (not too much earlier because the avocado will start to go brown), wrap it tightly with plastic wrap overnight and garnish with the cilantro in the morning. Hope that helps! I had made this recipe last night to bring to a Christmas party and let me just say this dish was a hit! So delicious and very easy to make. Hi Heather, I”m so so happy to hear that!! This is a total win!!! My 10 year old daughter made it for a super bowl party, but it is so good that it may not make it. We did cheat and use store bought vegan sour cream and pickled jalapeños. Kudos Jeanine on just another home run. This is such an amazing dish. It’s filling and healthy. Thank you so much for this amazing recipe. It was definitely delicious.